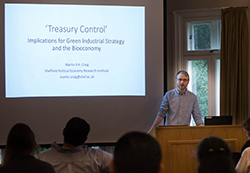 SPERI Deputy Director Craig Berry and SPERI Research Fellow Martin Craig gave presentations at a two-day conference on the Social and Political Challenges for the Bioeconomy. 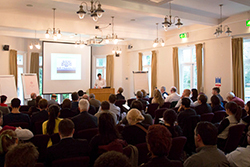 The two-day event was organised by CBMNET, the ‘Crossing biological membranes’ network at the University of Sheffield, Science and Technology in Society (SATiS), and SPERI. It brought together a large number of UK industrial biotechnology leaders and academics to discuss the challenges of bioeconomy and intends to forge new collaborations between delegates, who can go on to apply for funding to begin to solve these problems. Craig Berry’s presentation took as a focus the current state of UK Industrial policy and how the Bioeconomy fits into this policy. Craig stressed the importance of looking at how industrial policy is helping in other countries and highlighted that we must recognise and invest in biotech innovation that genuinely supports sustainability. Martin Craig’s presentation developed some of these themes and looked in detail at ‘Treasury Control’ and its implications for green industrial strategy and the bioeconomy. You can access his slides here. The conference raised a number of important questions on bioeconomy which will feed into future programmes of CBMNET.